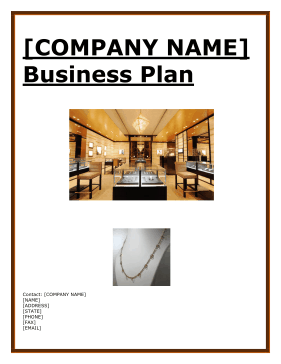 This is a free, printable business plan outlining the necessary services, organization and market strategies jewelry boutiques and those working in the retail sector. [COMPANY NAME] aims to become a leading provider of jewelry products and services for its area, utilizing the owner's five years of experience within this industry. [COMPANY NAME] will be a sole-partnership owned 100% by [NAME] and will be located in [CITY], [STATE] - in the [PLACE]. [NAME] will be the owner and manager of [COMPANY NAME], offering a variety of unique jewelry pieces as well as high quality repair and maintenance services, all available at competitive prices to the local community. [COMPANY NAME] has two distinct types of customers. Those who choose to buy jewelry for themselves (mainly female customers) and those who choose to buy it as a present for others (both male and female clients). There are also those who wish to utilize the repair and maintenance services the Company has to offer. The market will therefore focus on those above the age of 18, located specifically in [CITY], [STATE] as well as those in [CITY], which is only a 45 minute drive from the [PLACE]. The current financial plan for the [COMPANY NAME] will be to secure $245,000 in grant funding by the spring of 2011. This, alongside $30,000 of owner investment, will be utilized to purchase both short and long term assets such as jewelry cases, safes & security cameras, inventory as well as help cover the costs of accounting, marketing and a company vehicle, as outlined in the Milestones Table. 1. The [COMPANY NAME] is a 100% woman owned business. 2. Small boutique that carries outstandingly unique designs, not easily found elsewhere, offering customers a variety of options outside of big store names. 3. Purchased equipment will be the most energy efficient equipment available. 4. Hire employees; the Company will look to hire both minorities and the unemployed. 1. To become a recognized leader in the community for providing outstanding jewelry inventories and jewelry related services. 2. To aggressively expand during the first three years of operation. 3. To develop an online presence by developing a website with company information and advertising. 4. To operate the Business as environmentally friendly as possible. The [COMPANY NAME]'s mission is to become the recognized leader in its target market for providing outstanding jewelry inventories and jewelry related services. 1. Outstanding inventories and jewelry related services.